David was JoAnne's first love in the early seventies. When his family moved away, she felt like her heart would break. But as time passes, memories fade. They marry other people, raise families, and build successful careers. On their separate but often parallel journeys, JoAnne and David face unexpected heartache, fight off despair, and sort through personal baggage to learn lessons of love, faith, and perseverance. Then, thirty-nine years later, a surprising discovery reveals that everything happens for a reason. 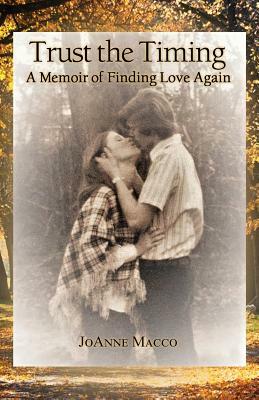 This true story, told from the alternating perspectives of two high school sweethearts, offers hope to anyone looking for a soulmate or grieving for a lost love. Trust the Timing will inspire the lonely to never give up because God has a plan, and second chances are possible. But first, we need to become ready.